De Quervain's syndrome is associated with pain and swelling on the thumb-side of the wrist. The underlying cause is irritation of the tendon sheath and the two tendons that run through this sheath. The symptoms are very similar to those of oarsman's wrist. The thumb and the wrist are moved by muscles located in the forearm. The tendons of these muscles attach to the various bone sections around the wrist, thumb and fingers. The tendons that go to the thumb glide through a smooth sheath in the wrist joint to ensure that the tendons experience as little friction as possible. Such a sheath is called a "tendon sheath". In the case of De Quervain's syndrome, there is irritation of the tendon sheath and the tendons that run through it. The affected tendons are those attached to the "extensor pollicis brevis" and "abductor pollicis longus" muscles. 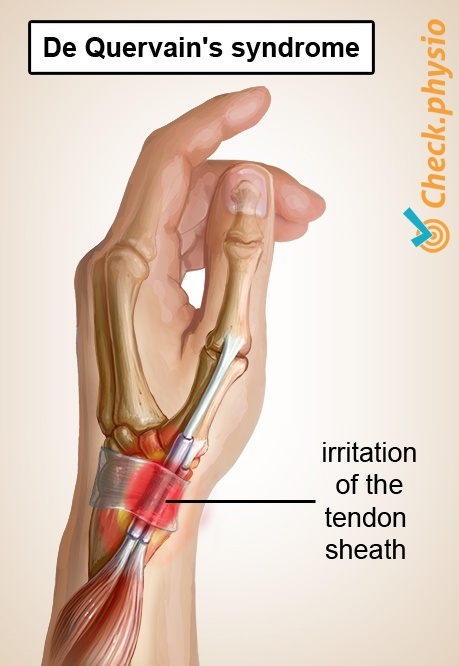 The irritated tendon sheath is located on the thumb-side of the forearm and causes pain symptoms there when the hand or thumb is used. The symptoms usually occur as a result of overuse. Examples include working in the garden or long periods of knitting. It is more common in those who play volleyball and racket sports rather than in other sports. Young mothers who care for a baby are also more likely to develop the condition from repetitively holding a baby tightly and lifting. Pain when flexing and extending the thumb, particularly with grasping and wringing motions. 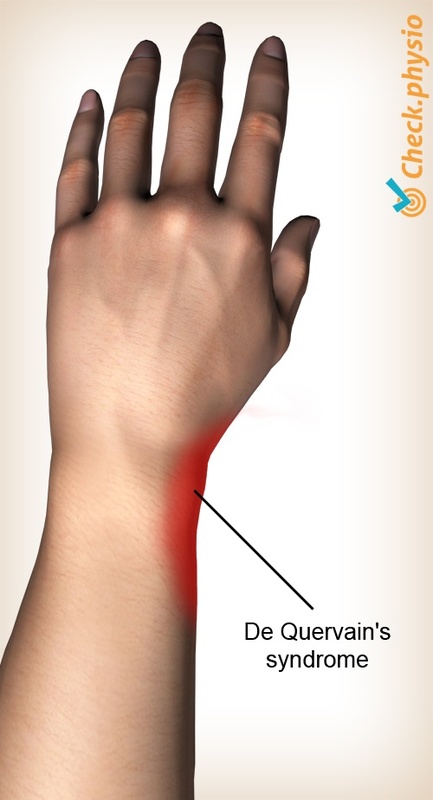 The pain is located on the thumb-side of the forearm. Swelling at the location of the tendon sheath. The tendons of the thumb can "snag". This can be associated with a snapping sound or sensation. Numbness can occur over the extensor side of the thumb and forefinger if the nerve in the affected area also becomes irritated. In many cases, rest and the prevention of further overuse is sufficient. A splint can be used to rest the joint for a short period. Anti-inflammatories or corticosteriod injections can sometimes be administered if the symptoms do not disappear. In extreme cases, minor surgery can be considered, in which the tendon sheath is opened to give the affected tendons more space.